A roof’s purpose is to keep the weather out of your building. Punching any hole in your roof requires a roofer to patch up behind you with no guarantee on preventing future leaks. The solution is KeeGuard roof railing. KeeGuard uses a weighted counter-balanced system to hold the railing in place. This leaves the railing sitting on top of the roof surface, creating zero penetrations. 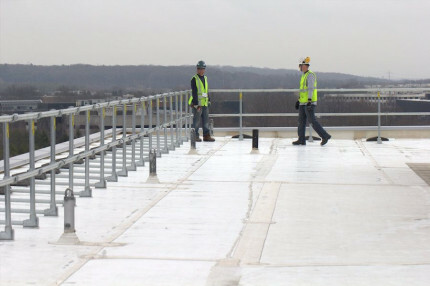 For a roof railing to be effective in preventing a fall, it must be able to resist the loads as laid out in OSHA 1910. OSHA requires that the top rail of the railing must be able to withstand 200 lbs of point load without failure. KeeGuard roof railing exceeds this requirement and has the testing documents to prove it. 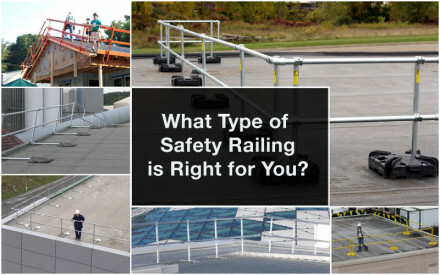 Each roof railing system is designed by a sales engineer to ensure the highest level of safety. Always ask for the test documentation. Most roofs were not designed with railing in mind. There are often obstacles on the rooftop that make the installation of railing difficult. KeeGuard uses modular fittings and standard pipe that make it easy to navigate obstacles that are located on the rooftop. Safety and aesthetics do not have to be mutually exclusive. KeeGuard roof railing has plenty of features that make it a great looking solution. The railing can also be powder coated so that it blends in perfectly with the aesthetics of the building. The roof railing can be angled away from the roof edge to make it less visible from the ground. The railing remains compliant but has a smaller "visual footprint" when viewed from the ground. 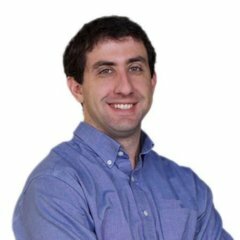 KeeGuard has a continuous railing. There are no breaks in the railing, making it look more pleasing and well integrated into the building environment. A roof railing that can be installed efficiently is another must! KeeGuard's modular design makes its assembly rapid without the use of welding or drilling. An Allen key, torque wrench, pipe vise and pipe cutter are all that is needed to install this roof railing. Unique non-penetrating temporary anchor points are also available to make sure that your workers are safe while doing the installation. Simplified Safety also offers several levels of installation services. We can come on site and help your crew install the system, or provide complete turn-key installation. The KeeGuard roof railing system is completely galvanized. Because it is not a welded system, it is far more corrosion resistant than most railings on the market. KeeGuard systems are built for long lasting durability. Annual maintenance will ensure that your railing lasts for many years. It's modular design also allows any damaged parts be easily replaced. Whatever the issues are surrounding roof railing, KeeGuard has the solution. The KeeGuard system is the industry leading roof railing solution because it performs well in all circumstances. What Type of Railing is Right for You? 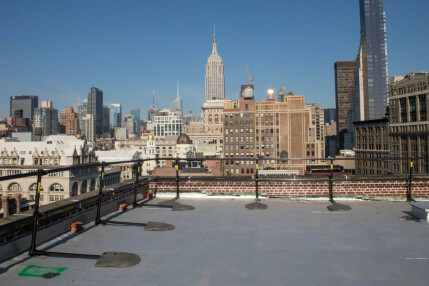 After a historic building in NYC was cited with multiple code violations by the city, Flag Waterproofing & Restoration reached out to Simplified Safety for help choosing the right perimeter guardrail to secure the building and become compliant.